Staff Note: For nine years, the tenants of San Francisco’s International Hotel have been battling to save their residence from the attempts by the Four Seas Investment Corporation, a Hong Kong based firm, to turn the area into a multi-story shopping center. The cause of the elderly Chinese and Philippino residents has been taken up by a variety of leftist groups, even supported for a while by the local sheriff, and criticized by others as a defense of squalor. Our writer, a Fifth Estate staff member emeritus, has been wandering the hemisphere and arrived at the I-Hotel as the final confrontation with the bodyguards of property began. Tuesday, August 2, 8 p.m. The program is over. It’s election eve. No fear of police intervention tonight. Tent city has been set up on wheels, on the back of pick-up trucks, private and rented. Tents were set up on the streets the previous 1 night, but were torn down by the police. Trucks and cars leave filled with people carrying posters and loudspeakers in an all-out effort to gather support around the city. Picket lines organized in front of the I-Hotel. About a hundred people marching in a long circle up and down. At least another two hundred watching. Again music by the band “Prairie Fire,” hard rockin’, screaming fighting music. Chanting, speeches, numerous signs of union representatives. Strong feeling that tonight something will happen. It’s in the air. The crowd has grown to at least two thousand people. Music chanting, speeches continue. The picket line stretches all along Kearny Street in front of the hotel and around the corner onto Jackson Street. Many foreign tourists, travelers, French, German, Dutch, Swedes have joined the picket line in support. Chanting in Spanish, Chinese, Philippino, English. Definite word that the police are massing in the area. Picket line begins transforming into a human barricade. Row upon row of people lock arms in front of the hotel. We stand six deep with arms interlocked and hands clasped around the waists of comrades in front. Chanting grows louder. I feel my legs trembling, can’t stop ’em. Speaker announces that the police are still massing and uncertain of how to deal with all of the bystanders. Everybody sits, waiting. Within minutes the police begin their offensive, turning, pushing, shoving, driving, forcing the far left wing of the human barricade over upon itself in a crushing fold. At the same time, mounted police break into the middle preventing any movement. Everybody is in a crunch, viced in by the cops. No room, nowhere to go. Screams, panic. The push on the left is still on. I’m wrenched between a parking meter and a truck in front of me filled with reporters and cameramen. A woman tries to climb into the truck and gets pushed back down. I feel only the bones of people around me, there is no room for flesh. The only way out is over the cab of the truck. We form a wedge and start pushing bodies up. I’m pushed up. Inside the truck. Helpless, watching the vice continue to squeeze, horses and clubs pummeling people. I move out and join the crowd on the other side of the police line. Kearny St. between Jackson and Columbus is now filled with at least 1,500 people. The whole area is cordoned off for at least eight square blocks. The vice begins to ease up. A number of bloody people are being carried over to the first aid van. A whole section of the human barricade is still intact, but the mounted police are cutting it up piece by piece. The human barricade is cleared. The police with sledge hammers begin pounding away at the doors of the I-Hotel. Each entrance, each storefront, is demolished in methodical order. The police are dragging out the inhabitants of the hotel one by one, dragging them down the stairs. Most of the tenants are in their fifties, sixties, and seventies. The lone voice hushes the crowd every twenty minutes. “The I-Hotel is a symbol of people fighting back against oppression around the world. We will not be moved by the rich to be replaced by a parking lot. The police carry a step ladder over to the corner of the building where the speakers send out the voice of the lone broadcaster inside. They snip the wires. Light is dawning over the East. Oh, say can you see, they’re dragging the last of the I-Hotel supporters out onto the street. Am very tired. Begin to follow a circuitous route home. Roadblocks everywhere. Cops hassle for I.D. Fall asleep listening to live history over the radio. Two security officers hired by Four Seas Corp. guard the hotel supplemented by a small horde of city police now nattily dressed in navy blue jump suits and ties. Workers boarding up the broken windows and doors. 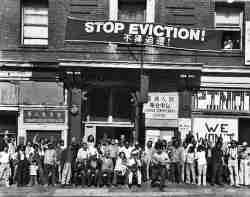 Newspaper reports that the cost of the eviction is estimated at $250,000. Newspaper reports that the demolition of the hotel may be delayed up to two years pending an environmental impact report, and court proceedings due to the status of the hotel as a historical building. Friday, August 5, 2 p.m. Pickets in front of the hotel again. Crowd of two hundred, mostly bystanders, cautious supporters. Around the corner a troop of riot police is marching around in tin soldier fashion. Cleaning up and boarding still in progress. Four Seas has doubled their security force to four rented cops. Protest is now reduced to a horn honking campaign. Honk in support of the International Hotel! Like a speed freak, or a terminal alcoholic clawing at invisible bugs in the air we fight back at what appears to bother us, striking empty air, getting pushed aside again and again by our addiction to struggle according to the precepts of the law. As long as the struggle remains legal, it gets crushed legally. Had there been four or five or six thousand supporters of the I-Hotel out on Kearny St. Thursday morning, it would have made no difference. Either the forces of the law would have doubled and trebled, or they’d wait another day. No matter to them, they get paid either way. The International Hotel Tenants’ Association and supporters are demanding that the city use its right of eminent domain to buy back the hotel from Four Seas Corp. and maintain it as low cost housing for the Chinatown community. Another paradox, another contradiction of the motility of capital. Calling on the authority of the oppressor to act on behalf of the people in direct opposition to its own motivating force, i.e. capital. “We hold the International Hotel as a symbol.” It’s not by accident that right next door towers the Holiday Inn of America with rooms for $52 a night, and that right behind that stands the Trans-America Phallus of Bank America, the real symbols of today, if not of ‘hearts and minds,’ then of pockets and authority. See the recent issue of the Berkeley Barb for the best coverage I’ve seen in any local paper, including photographs of Sheriff Hongisto, closet supporter of the tenants’ struggle, personally smashing down the doors of the rooms inside the hotel. Still unemployed…still waiting for benefits…broke, down and out in Chinatown S.F. at the Hotel Justice 2 blocks away from the International Hotel.